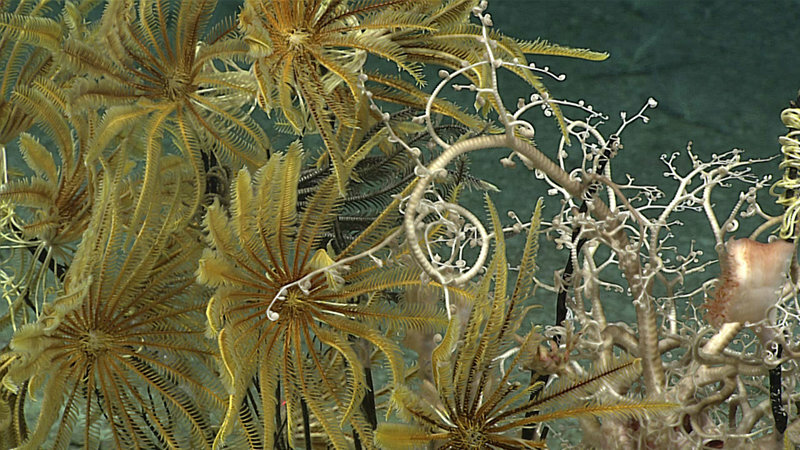 Small brittle stars living within the branches of a carnivorous sponge. Video courtesy of NOAA Office of Ocean Exploration and Research, 2016 Deepwater Exploration of the Marianas. Download (mp4, 41.9 MB). As you’ve been following our expedition, you may have noticed that we often come across animals living in tandem with other animals, which we sometimes refer to as associates. The relationship between associates and their hosts can be described as mutualistic, commensal, or parasitic. In a mutualistic relationship, both animals benefit from living together. Commensal organisms cause no harm to their host, but receive some benefit from living with them, while parasites actually feed off their host organism, thus causing harm to the host. One example of associates that we have seen several times on this expedition are ophiuroids (brittle stars) living within the branches of corals and on sponges. Ophiuroids are not parasitic, but are instead using their hosts to get further up off the seafloor into the water column to feed or for protection. The ophiuroids living on corals may be providing benefits to their hosts in return by keeping away possible predators and parasites. In general, mutualistic relationships are hard to detect because it is so challenging to observe and understand the precise nature of interactions between two organisms living together. A pair of commensal amphipods living on a sponge stalk. 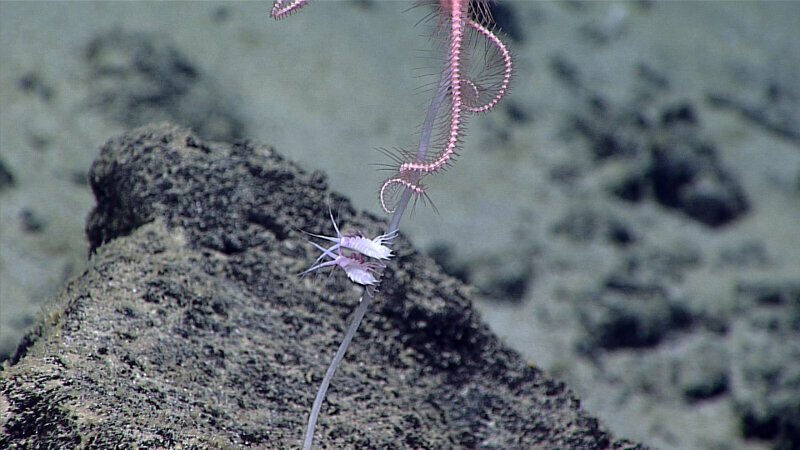 There is also a commensal ophiuroid at the top of the photo. Image courtesy of the NOAA Office of Ocean Exploration and Research, 2016 Deepwater Exploration of the Marianas. Download larger version (jpg, 1.2 MB). We have also seen numerous examples of amphipods living on sponges, often as a male/female pair. At the moment, we consider this relationship to be commensal since we can’t detect any obvious benefit to the sponge. A comb jelly (ctenophore) perched on top of a sponge stalk. Image courtesy of the NOAA Office of Ocean Exploration and Research, 2016 Deepwater Exploration of the Marianas. Download larger version (jpg, 980 KB). Another example of a commensal organism is the benthic comb jelly (ctenophore) that also lives on sponges. Most ctenophores drift along in the water column where they have easy access to passing particles and small organisms to feed on. However, commensal comb jellies instead perch themselves atop of a sponge to get access to food moving by in the currents above the seafloor. We have seen instances where multiple different kinds of organisms are all living on the same host. Perhaps the most conspicuous example we have seen during this expedition is what our team has coined (non-scientifically) the “crinoid Christmas tree”. This was a dead primnoid coral serving as a little apartment building, housing numerous feather stars (crinoids), brittle stars, barnacles, anemones, and even a large basket star. The “Crinoid Christmas tree.” A deceased primnoid coral is colonized here by crinoids, a large basket star, and an anemone. Image courtesy of the NOAA Office of Ocean Exploration and Research, 2016 Deepwater Exploration of the Marianas. Download larger version (jpg, 1.6 MB). There are likely many parasitic organisms living inside animals that we can’t observe with the remotely operated vehicle. 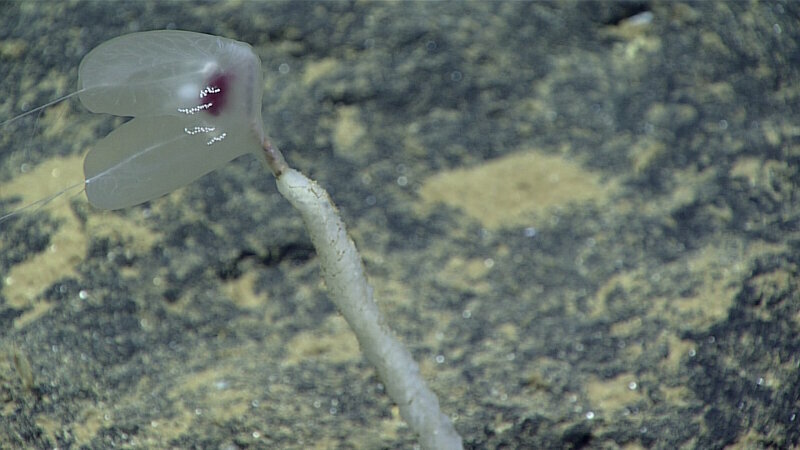 However, we have observed a couple of really strange and conspicuous parasites. The small white spots that can be seen on this fish in the family Stephanoberycidae are isopod parasites. 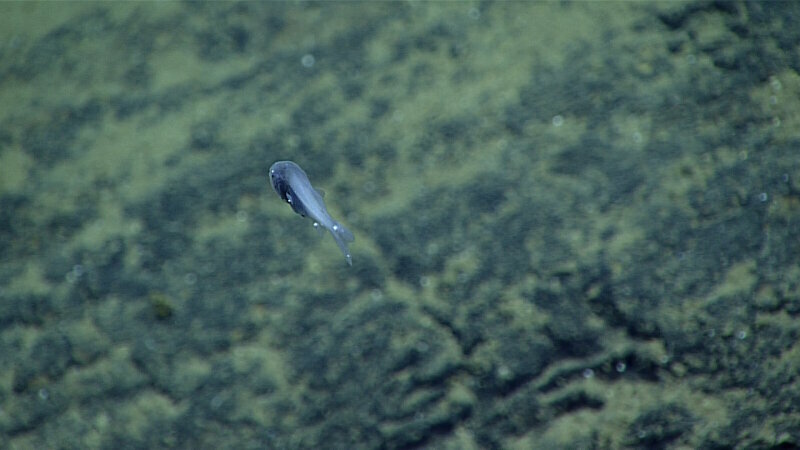 This pricklefish (Stephanoberycidae) was seen at nearly 5,000 meters at the edge of the Sirena Deep. The white spots are a parasitic isopod. Image courtesy of the NOAA Office of Ocean Exploration and Research, 2016 Deepwater Exploration of the Marianas. Download larger version (jpg, 914 KB). 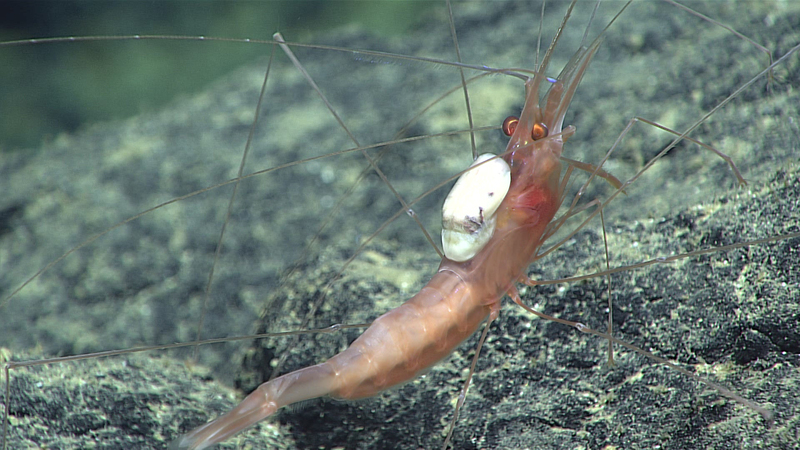 We are uncertain what this rather large parasite is living on the back of the shrimp in this image, but it sure looks uncomfortable to carry around! Because many parasites are small or internal, they remain one of the least-studied groups of animals, but there is a growing field of ecologists studying the role of parasites in the food web. Scientists were unable to identify the parasite living on the back of this shrimp. Parasites remain one of the most poorly described groups of animals in the world. Image courtesy of the NOAA Office of Ocean Exploration and Research, 2016 Deepwater Exploration of the Marianas. Download larger version (jpg, 1.1 MB). Continue following along with us online to see what other unusual inter-species interactions we find!